Nellie Sheridan Wilson’s bronze likeness will be unveiled on Saturday, September 29, 2018 at 11:00 a.m. in the southwest corner of Somerset Square - Somerset, OH. 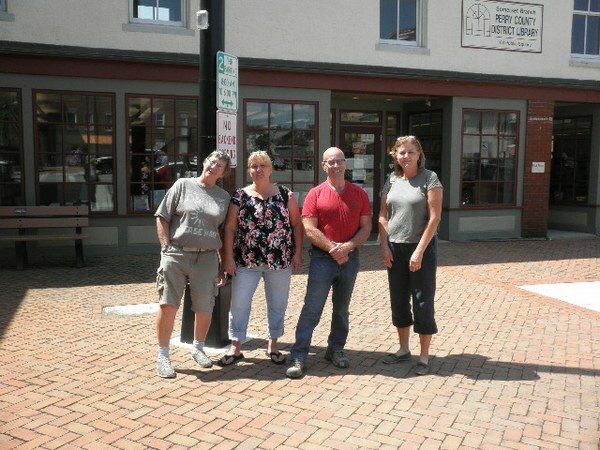 From left to right: Sue Noll, village councilwoman Michelle Siemer, artist Alan Cottrell and chairwoman Lori Dalrymple met Wednesday, August 22 to agree on the exact location and orientation of the bronze Nellie statue and the accompanying signage. It’s an exciting time for all who have contributed in any way to the project. Nellie Sheridan Wilson’s bronze likeness will be unveiled in the southwest corner of Somerset Square on Saturday, September 29, 2018 at 11:00 a.m.
Committee members invite everyone to participate and celebrate the life accomplishments of one of Somerset’s native citizens. Council president David Snider will emcee the event. Mayor Tom Johnson will welcome visitors and the Holy Trinity adult choir will set the tone for the festivities. Perry County historian Rob Dishon will brieﬂy comment on Nellie’s life. Current postmaster Mary Harris will do the unveiling. Sculptor Alan Cottrill will also be present. Gwen Young’s dream will be fulﬁlled because of the generosity of citizens and businesses in Perry County and the surrounding area as well as major donors North Valley Bank and Suburban Landﬁll. Artifacts from Nellie’s life will be on display in the library meeting room 10 AM to 2 PM. Following the ceremony, visitors can take part in Oktoberfest on Pigfoot Square, browse the Somerset Artists’ Co-op gift shop, check-out their yard and perennial plant sale, or participate in the craft beer pub crawl around town. For more information contact Lori Dalrymple, chairman of the Nellie Sheridan Heritage Committee (noldalrymple@aol.com), or Jerry Bryant (jbryant0225@gmail.com).